That contrasts sharply with the positions taken by Neomi Rao, administrator of the Office of Information and Regulatory Affairs, who stresses the burdens and costs of Obama administration rules. 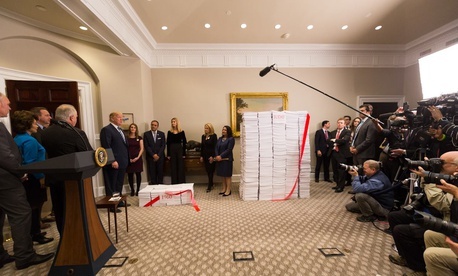 The draft report also comes as news outlets look back at Trump’s past year of pushing deregulation and question the administration’s numbers, ties to industry and assurances that health and safety benefits are not being shortchanged. In its introduction to the report seeking public comment, OMB struck a tone more consistent with its deregulatory approach: “New circumstances provide an opportunity to take a fresh look at how each of these analyses is conducted, and whether OMB is providing the public with the optimal level and scope of information,” it said. Some critics on the left seized on the mandatory report as a sign that the Trump approach is contradicted by evidence showing monetized benefits to be nearly 12 times higher than costs. “This report fundamentally undercuts the justification for President Donald Trump’s deregulatory agenda by showing that the benefits of federal regulation in protecting public health and safety as well as our environment and economy significantly outweigh the costs to corporations,” said Amit Narang, regulatory policy advocate for Public Citizen’s Congress Watch Division, in a statement on Monday.